There are numerous fast-paced puzzlers and acade games out there, and many of them are pretty fun. However, for the most part, there’s not too many original puzzle/acade games: they’re all either Tetris clones or some other knockoff. If you’re looking for something you haven’t already played, pick up Rebirth–it’s like no other Android puzzle game. The concept behind Rebirth is simple. Much like Tetris, blocks fall from the ceiling onto a gridded playing field. However, the blocks are not of variable sizes but instead all 2 by 2 combinations of yellow and blue. The goal of the game is to match up like colors into shapes that are by themselves 2 by 2 or larger. Are you in a hurry? Rebirth is perfect for that. It has three modes: Challenge, Time Attack, and Puzzle. They’re all unique and have different goals, but all share the same concepts. 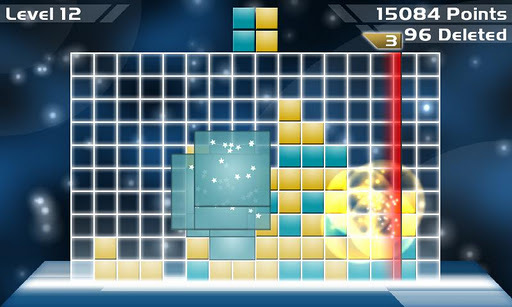 Challenge mode is shown off by the developers in the above video, and in it, you must avoid running out of space while simultaneously attempting to make as many squares as possible. Time Attack is much like Challenge mode, but since it’s a race against the clock to make as many squares as possible, there’s no need to worry about filling up the playing field. Puzzle is the most unique, and most interesting, of the three. Rather than focusing on making squares and rectangles, the goal is to create certain shapes using only one color. They can’t be touching any other squares of the same color, and at the same time, there are bonus points earned by creating the squares and rectangles. Rebirth is an awesome game, and it’s probably earned itself a permanent on my Nexus 7–it’s really a fun game. If you find yourself spending time flipping between your homescreens in boredom, or even just play lots of puzzle/arcade games, try Rebirth. You’ll like it!